Lightweight, fast-setting and reliable, this anchor gets fan mail. Made of high-tensile aluminum-magnesium alloy with no welds to weaken the metal, Fortress anchors are not only lightweight, they are strong! 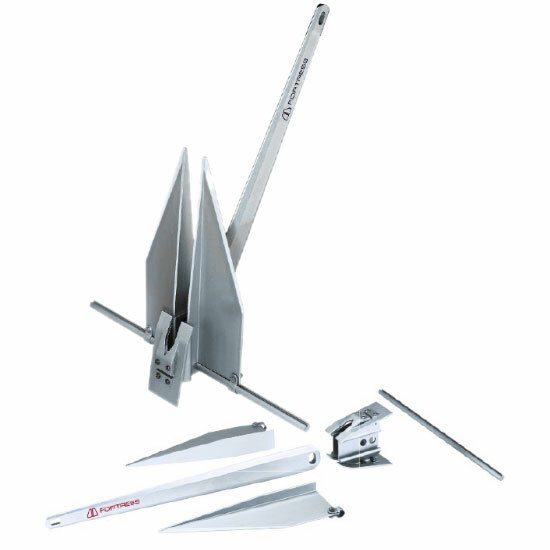 These anchors are versatile as well, with two adjustable shank angles: 32° for sand and 45° for soft mud. They are easy to handle and their light weight helps to minimize the load at the bow. Precisely machined, anodized, interlocking components are corrosion-resistant, nonmagnetic and as easy to put together as they are to take apart. For compact storage, we suggest a compatible Fortress Stowaway Anchor Bag (sold separately). Fortress Anchors are made in the U.S. Type approved by the American Bureau of Shipping (ABS). Models FX-37 to FX-125 are certified as Super High Holding Power (SHHP) anchors. Fortress anchors can be quickly and easily disassembled. Lightweight, fast-setting and reliable, Fortress anchors can also be disassembled for easy storage, which makes them the perfect choice for tight quarters where compact storage is a must. More importantly, Fortress anchors can be quickly assembled, which makes them the perfect choice for spare or storm anchors. In test after test, Fortress holds better. Since 1986, the much lighter Fortress has out-performed substantially heavier steel models in anchor comparison tests that have been conducted around the world. From older, well-established anchor brands like the Bruce, CQR, Danforth, or Delta to newer anchor models such as the Manson, Rocna, Spade, and Ultra, the Fortress anchor has consistently demonstrated that its superior design and lightweight alloy can provide outstanding anchor holding power at a fraction of the weight. What are the Mud Palms? The Mud Palms are a set of plates that bolt onto the crown of the anchor. They are included in the box with every Fortress and Guardian anchor. The Mud Palms are designed to help the anchor set faster in any type of sea bottom. They create a "lift" to the crown of the anchor, causing the flukes to point more directly to the seabed. This helps the anchor set faster—in any bottom. Design: Pivoting aluminum fluke made with high tensile aluminum-magnesium alloy. Pros: Extra-high holding power. Two shank angles for hard sand and soft mud. Lightweight and strong. Disassembles for storage. Lifetime parts replacement. Cons: Less effective on rocky or grassy bottoms. Light weight makes small sizes “sail” under water if boat is drifting backwards quickly. Anchor size recommendations are for boats of average windage and proportions, 30 knots of wind, average bottom conditions, and moderate protection from open seas. For storm conditions, we recommend using an anchor one or two sizes larger.